We are very excited to announce the opening of Vetwest Ellenbrook. Our brand new hospital is now complete and we are looking forward to meeting you and your pet's. With state of the art facilities and Vetwest's high standards of care, you can be confident you are receiving the highest standards in veterinary care for your furry, feather and scaley friends. We are located at The Shops at Ellenbrook right next to PETstock, First Choice Liquor and the new Aldi Supermarket. Vetwest Ellenbrook offers a full range of veterinary services including our popular Total Wellness Plan. To make an appointment call us on 9404 1180 or book online. One of our newest facilities, Vetwest Ellenbrook is located at 11 Main Street, on the corner or The Promenade and Link Way, Ellenbrook 6069. 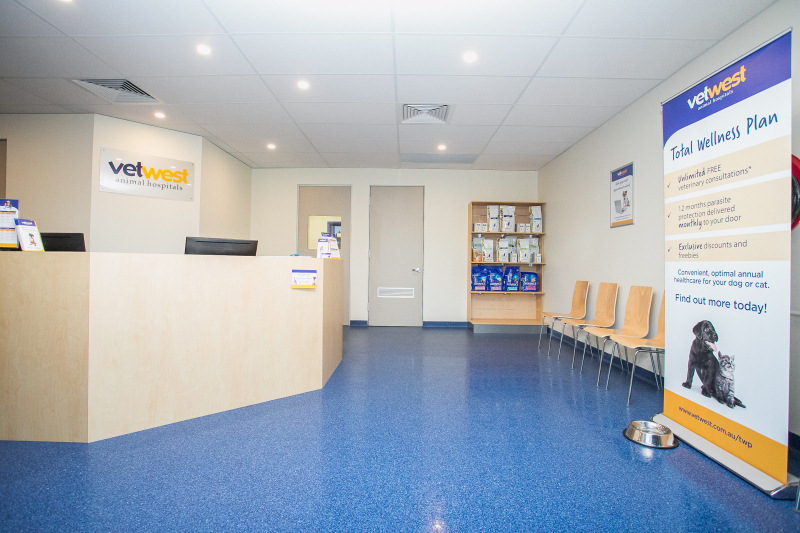 Vetwest is situated next to PETstock, First Choice Liquor and Aldi at The Shops at Ellenbrook and with plenty of parking directly in front of the clinic, making a trip to our vet hospital with a potentially unwell or injured pet is much easier. The main thoroughfares of Gnangara Road, West Swan Road, Reid Highway and Tonkin Highway all lead to the Swan Hills and the beautiful woodlands and wetlands you can find in Ellenbrook. Found in the north east region of Perth, approximately 21km away from the CBD, Ellenbrook is a beautiful, green area with a lively and close community spirit and a completely self-sustainable approach to local life. Since its development in 1992, Ellenbrook has evolved into one of the fastest growing suburbs in Western Australia and we are proud to be a new part of the Ellenbrook story and to have the opportunity to care for the pets in this region. Our clinic also looks after pets from the surrounding suburbs of Melaleuca, Aveley, Baskerville, Cullacabardee, The Vines, Millendon, Lexia, Belhus, Whiteman, Herne Hill, Brigadoon, Upper Swan, Brabham, Bullsbrook and Henley Brook among others. Our new vet hospital has cutting edge facilities, ensuring that we have the best service capabilities and pet accommodation in the area. Our team warmly treat your pets like family and we are confident that we can exceed the expectations for high class animal care and treatment. Our qualified veterinarians keep up to date with the latest information so your pet gets the best treatment and we run frequent competency training for our entire team to ensure a continual high level of knowledge and skills to better service your pet’s needs. Our vet nurses are not only highly qualified but extremely warm and friendly so you know your pet is in good hands. With our new state of the art clinic, we offer a wide range of services for your furry, feathered or scaly loved one and the highest standard of care available. Our popular free nail clipping and free nurse advice and clinic service is a client favourite. Just call us up to make an appointment and bring your dog or cat in for their free nail clipping in a relaxed and calm environment. If you have a new puppy or kitten in your family, our nurses will also chat with you in an appointment and give you free advice on how to best care for your new addition. Our team is passionate, highly skilled and completely invested in providing the highest standard of service to our family of clients and pets and most importantly - we love what we do! Vetwest Animal Hospitals have been in Perth for over 20 years, and we are focused on providing the highest level of care for you and your pet. We are open until 7pm from Monday to Friday, perfect for after-hours appointments. We are also open from 9am until 5pm on Saturdays, giving you more opportunity to schedule in an appointment time that works for you and your life. Be sure to call Vetwest Ellenbrook today to schedule your next appointment – we look forward to meeting you and your pet!